Which is deadlier, a drug-running hippie death cult or two lovers who dig their comic books and sf? Tragic history says the dirty smelly hippies, but the only caveat is the fannish logger husband will be played by Nic Cage. He will have a chance for a full freak out when the cult leader abducts his wife in Panos Cosmatos’s Mandy, which screens during the 2018 Fantasia Film Festival. Red and Mandy Miller live happily in a remote cabin nestled in the Shadow Mountains. 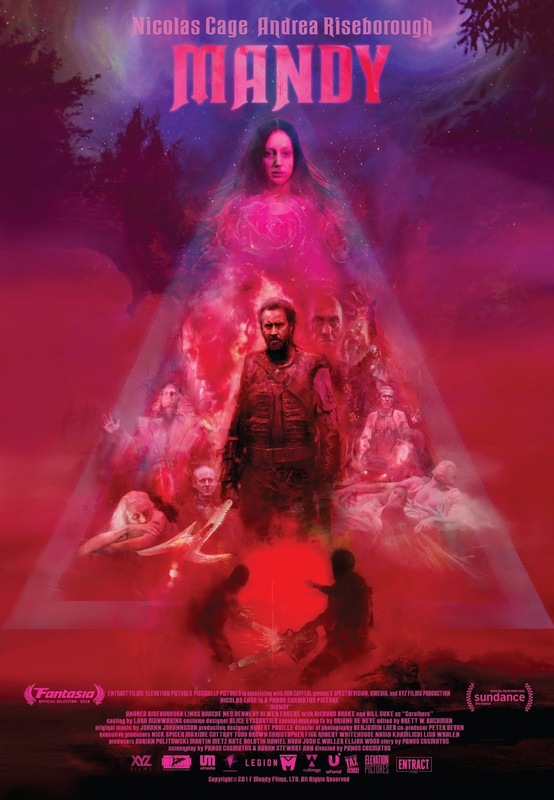 It is an Eden-like existence, until Mandy attracts the attention of Jeremiah Sand, a hippy cult leader most likely inspired by Manson, right down the failed release of hippy-dippy rock album. With the help of the vaguely supernatural Black Skulls biker gang, Sand and his brotherhood stage one of the most vicious home invasions you could imagine. Initially, Sand tries to brainwash her with a special cocktail of mind-control drugs, but when Mandy resists their influence, he brutally murders her before Red’s eyes, leaving him for dead. That would be the cult’s only mistake and it might be enough to bring them down. Still, Miller’s crusty old trailer-dwelling crony warns him this vendetta could cost him his life, but Red is in no mood for such talk. Essentially, Mandy is the male version of I Spit on Your Grave, as re-envisioned by Boris Vallejo, featuring fantastical matte paintings and brief animated cosmic interludes. Cosmatos doubles down on all the hazy neon visuals and synth-heavy proggish 1980s soundtrack music (think Tangerine Dream warmed up in Hell) that made less discerning cult movie fans flip for his first film, Beyond the Black Rainbow. However, this time around, he is also working with a narrative. So, yes, this film is completely bonkers, but Nic Cage is right there with it, every step of the way. Forget about Leaving Las Vegas. This will be the film he will be remembered for forty years from now. He unleashes the Cage of Wicker Man and Mom and Dad for full effect. He is not quite Isabelle Adjani walking through the subway tunnel in Possession, but he is in the same gated community. Despite their classy pedigrees, Linus Roache and Andrea Riseborough keep in the spirit of the proceedings, as Sand and the title character. Plus, for an extra dose of hardnosed badassery, Bill Duke appears briefly but memorably as Miller’s old Jedi Master. Just so you know, there is a chainsaw duel in Mandy. At one hundred-twenty-one minutes, it is shamelessly self-indulgent in just about every way possible, but you cannot accuse of getting stingy with the madness. Frankly, it over-delivers on the promised lunacy. Highly recommended for midnight movie regulars who fully understand what they are getting into.